Walking is by far the most popular activity in the Cairngorms National Park, and probably the most varied - not just in terms of length and difficulty but also in terms of surroundings. The sheer size, scale and remoteness of the Cairngorms make them one of the most dramatic and harsh mountain environments in Britain, a challenge to even the most seasoned hillwalkers. However, you don't need to undertake a serious expedition to enjoy the hills of the Cairngorms. 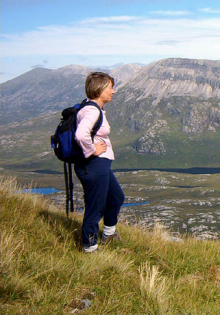 Many of the 43 Munros, including five of the six highest mountains in Britain, can be tackled in a day with basic equipment and navigation experience. And by following the old drove roads and passes, the wild heart of the National Park can be experienced without trekking over summits.